A year ago, a group of prominent economists led by Raj Chetty of Stanford University came out with a splashy piece of research measuring exactly how much each college in the nation helps working-class kids rise up the economic ladder. (Splashy for nerdy education circles, at least. See hereand here.) It was a giant data project, tracking how much students earned after they left college through millions of anonymous income tax filings. Predictably, the economists found that some low-income students joined the top 1 percent after attending an elite college but very few poor kids get that opportunity. Meanwhile, many more low-income students attended lower-tier colleges and didn’t enter the middle class afterward. You’ve probably heard the stories about the millions of dropouts who are saddled with debt. Percentage of the student body from bottom 20% that earn in the top 20% as adults. From PowerPoint presentation of John Friedman of Brown University. However, the economists also highlighted a list of colleges that defy these two archetypes, where large numbers of low-income students are admitted, graduate and earn middle- or upper-middle-class incomes as adults. Topping this list (see adjacent chart) is the Los Angeles campus of California State University, where almost 10 percent of the student body came from families in the bottom fifth, living on less than $25,000 a year, but ended up earning more than $60,000 a year as adults in their mid 30s, putting them in the top fifth of society. Last month, John Friedman of Brown University, one of the economists working with Chetty — along with David Deming of Harvard University and Nick Turner of the Federal Reserve Bank — gave a preview of this new of line research at a meeting of the Association of American Colleges and Universities in Washington, D.C. The economists tracked more than 10,000 students who had been admitted to a CUNY program called SEEK that helps academically borderline, low-income students complete a four-year degree. They found that SEEK students earned more money as adults in their late 20s and early 30s than academically similar students from higher-income families. The results are interesting because the SEEK program, which stands for Search for Education, Exploration and Knowledge, has been around for more than 50 years and was an early attempt at CUNY to give low-income students a boost. Today, CUNY invests more resources in newer and sometimes more expensive programs to help struggling low-income students. However, this research shows that old ideas can still work. Almost 11,000 students were enrolled in CUNY’s SEEK program as of the fall of 2016, the most recent year for which data is available. Some 420,000 students have been through the program over the course of its 50-year history. The SEEK program gives extra financial, academic and counseling support to low-income kids who just miss the requirements for admission to one of CUNY’s four-year colleges, such as Hunter or John Jay in Manhattan, because their grades or test scores are too low. The students are poor enough that federal Pell grants and other financial aid already cover their entire tuition, currently over $6,500 a year. CUNY kicks in additional funds to cover their fees and gives them a stipend to pay for books. From the student’s perspective, it’s a free ride for four years, except for living expenses. Together with the extra instruction and counseling, SEEK costs roughly $2,700 per student or $11,800 over four years. The economists compared the future earnings of students who were born in the 1980s and were admitted to the SEEK program in the late 1990s and early 2000s with two different groups of students who had also applied to CUNY’s four-year colleges. The first group of roughly 17,000 students was just as poor as the SEEK students but their applications were much stronger and they were accepted because of their high school grades and test scores. 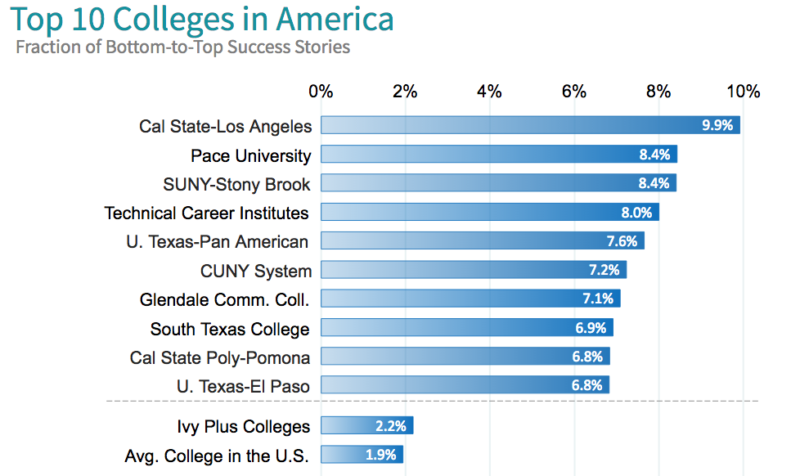 Some of these poor but smart students attended CUNY; others attended more prestigious colleges. Friedman found that later in life, the SEEK students earned the same as these students. The second group of almost 14,000 students was denied admission to CUNY’s four-year schools because their academic records were too weak. If they had been poor, they would have been eligible for SEEK, but their families’ incomes exceeded program limits. Many of them began their studies at one of CUNY’s two-year community colleges. Some went to other institutions. Years later, the low-income SEEK students earned $4,000 more a year, on average, than these students from more affluent families. The economists believe that this earnings differential will probably persist their entire working lives, adding up to $120,000 over 30 years. It’s unclear why the SEEK program works, whether it’s the extra financial aid, the extra instruction or the extra counseling. Friedman suspects that the key ingredient might be different for a student with a college-educated parent compared to a student who’s the first in his family to attend college. The economists hope to tease that out in future research.